These dogs are our breeding crew and are not for sale! Angel's name fits her perfectly! She is a perfect little angel. Angel is a beautiful White Chocolate with green eyes and a beautiful, soft mega coat. She is calm yet loves to play, obeys commands, and exceptionally sweet. Angel comes to us from Kalapo Schnauzers. Thank you Crystal for such a lovely girl inside and out! Angel is still a young lady and will need to do some maturing before she has pups. Look for Angel's pups in late 2016 or early 2017. 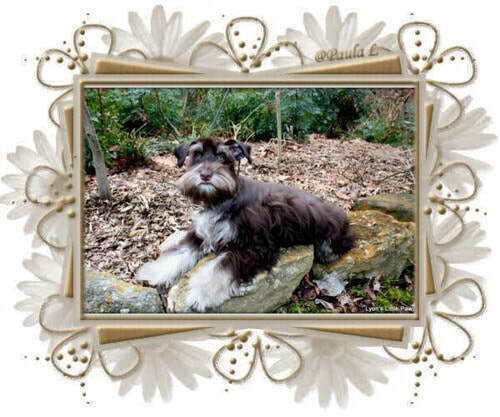 Denver comes to us from Schnauzer's 101 in Colorado. Denver is a beautiful Blue Merle girl with a thick mega coat. She loves everyone including children - super sweet schnauzer. She is a Blue Merle with a stunning mega coat. Ask to see her when you visit and I am sure that you will fall in love with her. 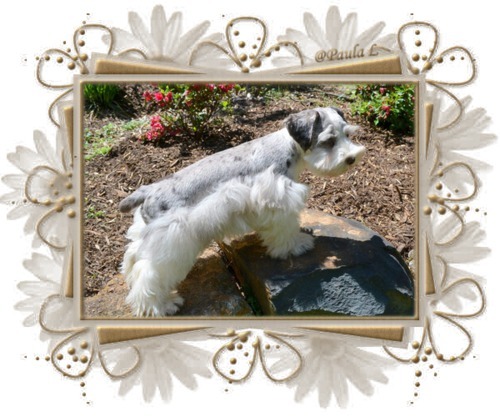 Thank you Crystal at Schnauzers101, for this beauty! Annabelle is a super sweet little girl. She is a beautiful Liver (Chocolate) mega coated girl. She is just a precious and has a wonderful personality. Annabelle will produce beautiful mega coated puppies. Her pups will be sweet and cuddly just like her! Coco is a super sweet little girl. She is a beautiful Liver (Chocolate) mega coated girl. She is super sweet and has a wonderful personality. We will be breeding Coco as soon as she is old enough. She will produce beautiful mega coated puppies. Coco is the daughter of Lyon's Cha Cha Chocolate and Lyon's A Whole Lotta Lovin' Tanner. Root Beer is a an awesome girl. She is a beautiful Liver Tan Phantom mega coated girl. She is super sweet and has a wonderful personality. We will be breeding Coco as soon as she is old enough. She will produce beautiful mega coated puppies. Coco is the daughter of Lyon's Fudge Swirled Bear and Lyon's Sweet Chocolate Treasure "Rolo". She will be around 16 pounds. 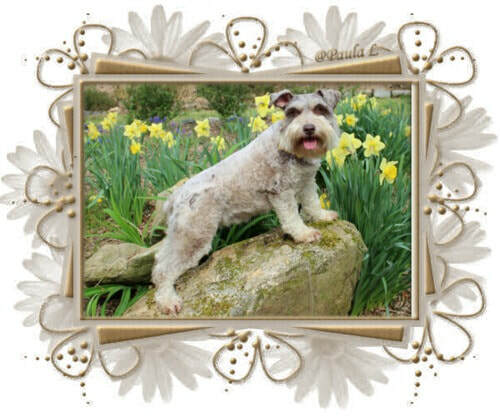 Brownie is a lovely Liver Miniature Schnauzer. She has beautiful green eyes and a super nice Mega Coat. Her nice coats is clipped back in these pictures, but it is really beautiful. Hopefully, I can get some more pictures when she grown back out. Luna such a beautiful girl! 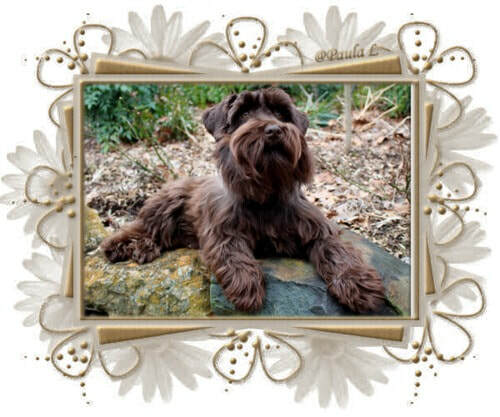 She is a Chocolate Merle Parti Schnauzer with beautiful green eyes. She is super sweet girl and has a beautiful mega coat. Her puppies are fantastic! Luna is a full sister to Rolo and is a daughter of Porsche & Merlin. 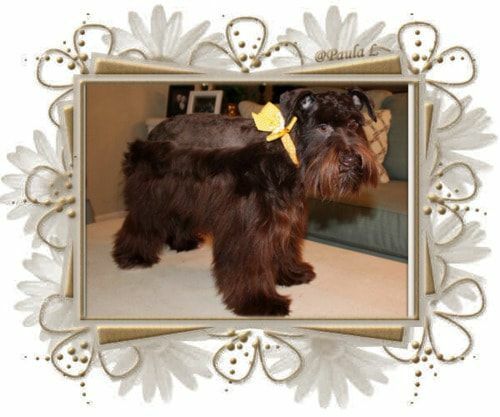 Tootsie is a beautiful Chocolate Schnauzer with beautiful green eyes. She is full sister to Jade and Gypsy. She is a really sweet girl too and has a beautiful mega coat. She has lovely puppies as well. Tootsie is a daughter of Maddie & Merlin. Jilly is also a young girl and will grow and mature until she is old enough to breed. Probably around March of 2019. Jilly's sire is Tanner and her Dam is Cha Cha Chocolate. Jilly is a beautiful girl!. She has a beautiful thick and soft mega coat. This is our favorite line and I am sure that her puppies will be gorgeous as well! New breeding crew for 2019/2020. We will have to wait a while for her pups, but I am sure that they will be spectacular!